i thought i'd bring the family daytona out of hiding and share a few photos. it is a b5/b7/440/auto car. it is not, and will not be, for sale. my parents bought the daytona new, and it saw daily driver usage until around 1977. amazingly, this is the only vintage photo showing the car that i have ever been able to find, and even then it was not the primary focus of the photo. the nose has been awol since the 1970's. a lead-footed male owner, combined with the insurance company's dislike of high performance cars, meant it was not in the cards to have the nose replaced when the daytona rear-ended my grandparents' 1968 fury. the parents were adamant about not using fiberglass parts to replace the nose, so it has worn a regular charger front end ever since. life somehow got in the way, and the car was more or less "out of sight, out of mind" over the years. other than moving it to their new pole barn two years ago, the car has not been outdoors since 1985, when the engine grenaded. it had sat on a car trailer, in the barn of a family friend, for over twenty years prior to the homecoming. now that the parents' interest in restoring it has picked up a little, it comes down to rounding up the funds to do so. i guess their advancing years have brought on a bit of nostalgia for the car, and it would be nice to have it finished while they are both still around to enjoy it. after several requests over the last year or two, the buddies and i finally dragged it outside to shoot a few photos today. we dusted it off with a brush, hit the glass with some windex, and here is the end result. Cool story and vintage picture.. But, I'm sort of confused.......... Is this your parent's Daytona that's picture at the beginning? Very cool! though i would put a nose on it! even if its fiberglass! more pics!!!! the photos are all of the same car. the first one is from around 1970, estimating by how old my sister and i appear. So, are your parents going to restore it with your help? Awesome story!! What was the original color of the car? B5 with black interior? that is the million dollar question. hopefully, a start on restoring it could occur sooner, rather than later, but only time and the checkbook balance can tell. Very cool! though i would put a nose on it! 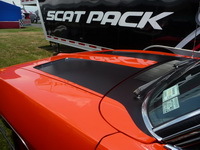 even if its fiberglass! more pics!!! the car was originally b5, with a b7 interior. (i went back and added that info after your question) the door panels were changed to black ones when the seats were customized in the early 1980's. the original headrests are still around, but i'm not sure if the blue panels are. All I can say is "WOW". Do they still have all the original paperwork? Wow, those seats remind me of a couch my Grandma once had! just the warranty booklet and broadcast sheet. the dodge dealership is long, long gone, leaving little hope of obtaining the old sales paperwork. the statement of origin must have carried the "XS29" error, as the title was re-issued at some point. the dash plate and fender tag both read "XX29" as they should. no one was aware of the VIN issue on the title itself until i happened to read about it in a magazine article way back when. 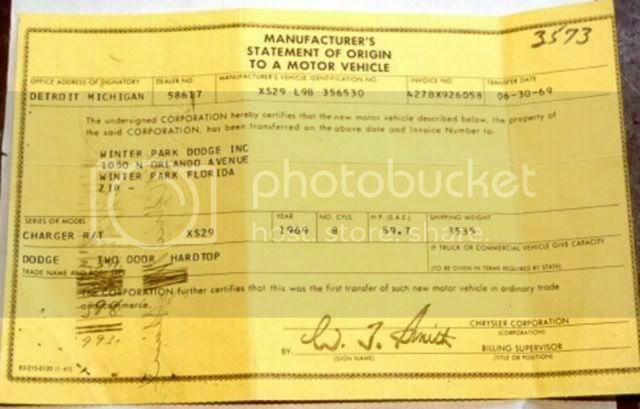 the (indiana) title to the car still shows the september 1969 purchase date, but has "corrected title" printed across the top. id like to thank you for keeping the car under the radar until the parents were ok with it being brought up. it was a pleasure meeting you at indy. dad recalls talking to your dad via phone many, many years ago, and it was ironic he remembered your dad's name when i mentioned talking to you. i want to also extend a thank you to danny for the same courtesy, as he has known of the car for some time. it is located near where he grew up, and we have had a few conversations about the car in the recent past. the daytona was purchased at Farthing Sales in Rushville, Indiana, twenty miles from where it has spent its entire life. 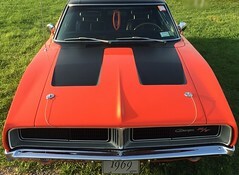 this coronet r/t, also bought new at the same dealership, was traded in on the daytona. 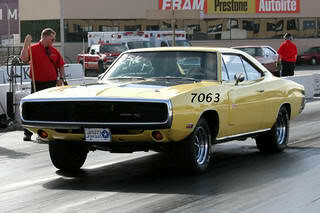 the r/t was a pet project of the mechanics' there, and was tweaked to run like a scalded dog, according to dad's tale. dad worked at the chrysler plant here in town, and heard through the rumor mill that chrysler was going to build the daytonas. he told the salesman of his r/t that he wanted one, and the response was "no problem, we will get it for you". (true to his word, as here the car is) dad has often stated his only regret was in assuming the daytonas would all be built one way, or this one would have been a hemi car. as it was, the car was ordered/purchased sight unseen, with no idea of how it would be optioned. the charger emblem is just awol. it had one, and still has the mounting holes. while zooming in on the original photo to confirm this, i just noticed the chip in the right tail light lens. this project is getting more costly by the minute. sorry, i somehow duplicated a post. wow ! good story !! awesome load of pictures ! thanks for sharing all this stuff !! Looks like the car had a whole repaint at some point going by the door jambs with the striker and latch hardware being painted body color. Also, something about the rear stripe doesn't seem right. Can't put my finger on it yet but looks like it might be too big. 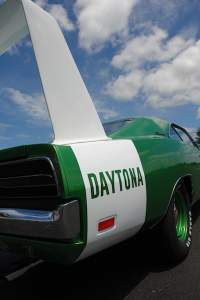 I know it is missing the "DAYTONA" word on the stripe also so maybe that is it. That is GREAT! Another B5/B7 Daytona from here in INDIANA! 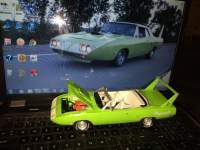 Thats nothing....every 6 months another green Superbird turn up. Breathing life back into my baby! With all due respect to those "lowly" Superbirds, that ain't a lie. Interesting in that the first photo from 1970, the car is parked, headlights are already up, probably with a vacuum leak. Awesome story & photos, thanks for sharing! That's going to be a good feeling, bringing a car like that back to life after all these years. Can the original motor be saved? It's amazing what can be rebuilt now-a-days that used to be considered nothing but a boat anchor. Most of the headlight vacuum components on my car are either new or very low mile OE takeoffs (except the nosecone lines and connectors/tees), but its headlights start creeping up after about 10 minutes. Seen a few other wing car photos from back in the day with headlights up, and those makes me feel just a little better. I'm not looking forward to tracking down the leak. Looks like the car had a whole repaint at some point going by the door jambs with the striker and latch hardware being painted body color. Also, something about the rear stripe doesn't seem right. Can't put my finger on it yet but looks like it might be too big. I know it is missing the "DAYTONA" word on the stripe also so maybe that is it. Nice story thought! the car has had four repaints over the years, starting with a complete one when it was a month or two old. before the car was even picked up, the dealer had done some repainting around the rear window, and the car had both lacquer and enamel paint on it. was this typical? one day, dad happened to be at the dealership at the same time as the chrysler zone manager. when the dealership service manager informed the factory rep that a customer wanted paint issues fixed, the rep asked him what model of car. when told it was a daytona, the factory rep authorized the warranty work without even looking at the car, which was sitting outside. at one point in the mid 1970's, the car was painted steel blue, without the stripe. the daytona, in this color, is barely visible in this mid- 70's photo of the torino that replaced it as the primary daily driver. the wheels on the ford might look familar, as they were borrowed from the daytona. prior to the paint job found on the car now, it was also a candy apple red for a very brief time. the currently seen stripe was hand masked and spray painted on. it is nowhere near correct in its dimensions, but bear in mind, this is 30+ year old paint work done on a car that was nothing more than a typical used car at the time. I have to wonder if showing dad the thread about your car led him to think of how this car could look again. I might have to get you to fill my email inbox up with some high resolution pictures, to keep working on him. Speaking of emailing photos, I have a handful of nice ones that i took at indy which feature a certain beer sponsored stock car you mentioned being fond of. the engine was replaced twice under warranty, so this car was not numbers matching, even way back. on the second occurence, dad says six of the eight rods made their own exit holes, just above the oil pan. if i can ever find the photo, this is the basis for an entertaining story about the car. the engine failure in 1985 saw the broken camshaft remove all of the lifter webbing above it in the warranty replacement block. i believe the engine sitting in the car now is a 1970 six pack casting, but do not recall the date codes on it to be certain. Great story of this 1 owner car where you can document with pictures and 1 st accounts this daytonas living timeline history.The daytona I had from a original owner. Also told me his paint around the back window was peeling after a few weeks.